Mon., Aug. 21, 2017, 12:34 p.m.
WASHINGTON – Senate Majority Leader Mitch McConnell, R-Ky., said Monday that there was “zero chance, no chance” Congress would fail to raise the debt ceiling by late September, though he offered no clues about how he hoped to convince lawmakers to back such a measure. McConnell spoke during a public event in Kentucky with Treasury Secretary Steven Mnuchin, who minutes before had implored Congress to focus immediately on raising the debt ceiling when members return to Washington after Labor Day. Mnuchin said the debt ceiling must be increased to ensure that the U.S. government can pay its bills. “There is zero chance – no chance – we will not raise the debt ceiling,” McConnell responded. The federal government spends more money than it brings in through revenue, and it issues debt to cover the gap. The United States already has close to $20 trillion in debt, and it can only borrow money up to a certain level set by Congress. Mnuchin has said he’s able to pay all of the government’s bills only through Sept. 29, and he wants the debt ceiling increased so that he can continue making payments. Some Republicans have said debt ceiling increases should be linked with spending cuts, a position Mnuchin has advised against. 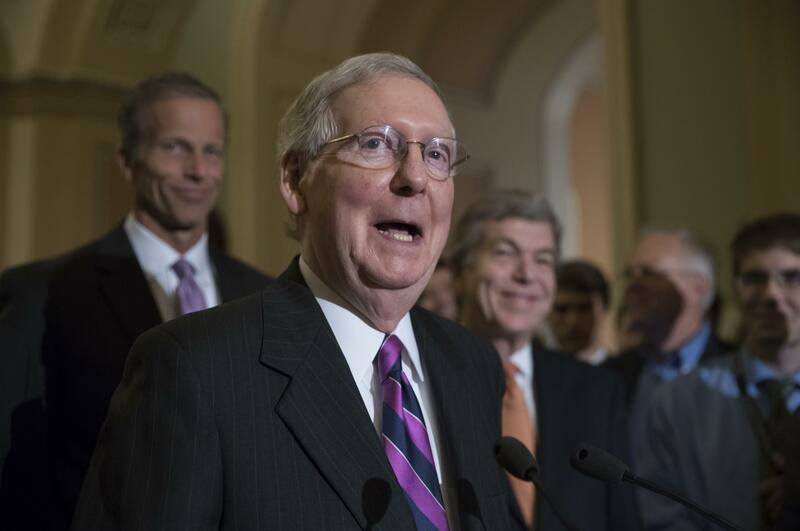 McConnell will need support from Democrats to pass any increase in the debt ceiling, and so far Democrats have not stipulated what kind of bill they would support. If Congress fails to act on the measure it could mean that the U.S. government defaults on its obligations, leading to a spike in interest rates, a stock market crash and a possible recession, economists have predicted. Mnuchin urged Congress to pass a “clean” increase in the debt limit, referring to a bill that simply increases the debt ceiling and has no other policy changes or budget cuts attached to it. Many Republicans have signaled they would not support such a measure, and McConnell and House Speaker Paul Ryan, R-Wis., have not yet backed any specific bill. One option would be for GOP leaders to try to attach an increase in the debt ceiling to a popular bill that is sure to pass Congress, but that scenario also poses risks because lawmakers could still try to change the bill or threaten to block it if they want to force concessions. The Treasury Department has been drawing down its cash reserves for months to delay the difficult vote on the debt ceiling. Treasury had more than $350 billion in its cash reserves account when President Donald Trump took office in January. Last week, this cash reserves account had just $82 billion in cash remaining. Mnuchin also offered assurances on Monday that the debt ceiling would be raised in time, though he didn’t map out how congressional leaders would muster the votes. “We’re going to get the debt ceiling passed,” he said. Published: Aug. 21, 2017, 12:34 p.m.